The British Embassy in Lebanon along with the Online Collaborative had the pleasure to host a dinner tweet-up in honor of the 30 delegates of British Embassies from all across the Middle East & North Africa region this Wednesday, October fifth.The dinner took place at Amarres in Zaitunay Bay. 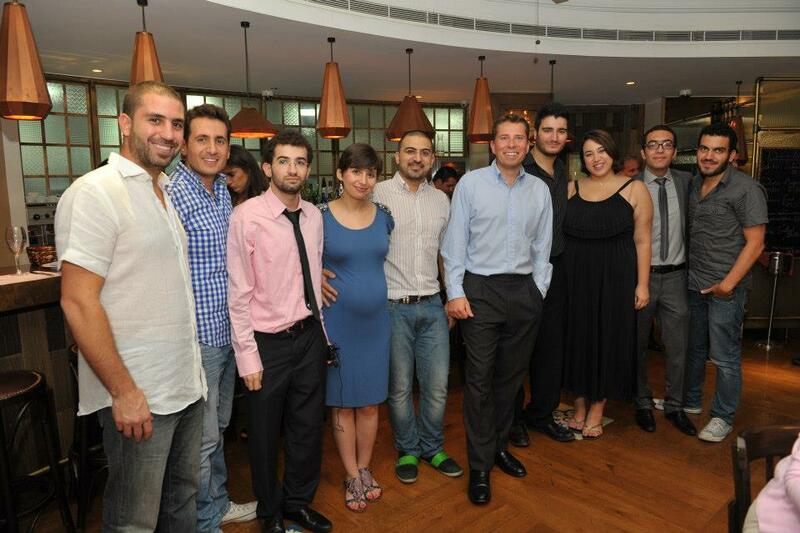 The British Ambassador to Lebanon HMA Tom Fletcher, the delegates, media figures, a group of influential tweeps in Lebanon and distinguished members of Online Collaborative enjoyed the delicious food sponsored by Amarres Bistro & Cafe Français. Attending delegates from Algeria, Bahrain, Egypt, India, Jerusalem, Jordan, Lebanon, Morocco, Saudi Arabia, Syria, Tunisia, and the U.A.E., found the tweetup an opportunity to collaborate with each other, and with the Online Collaborative teams. 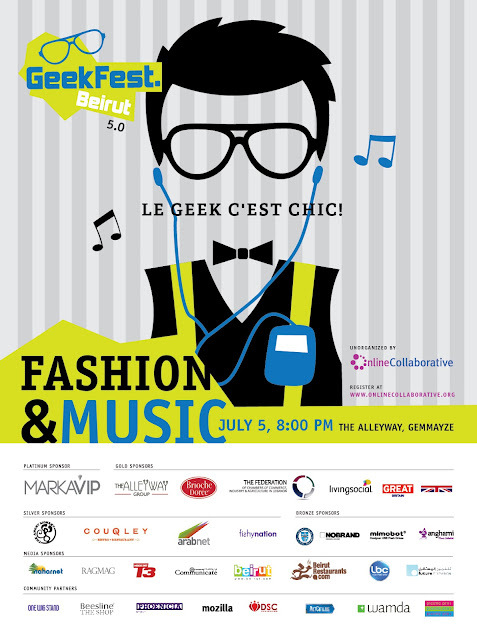 Geekfest 5.0 brought out all that is geeky in fashion and blend it into the urban tunes of modern Lebanese Bands and Performers. Over 400 people attended this event and listened to speakers talk about what's geeky about music and fashion, watched the fashion show, listened to a variety of performers and enjoyed an art gallery. 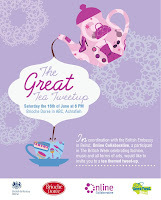 Online Collaborative, in coordination with the British Embassy in Lebanon, part of #britweek and a pre-GeekFest Beirut event, held The GREAT Tea Tweetup on Saturday 16th of June, 2012. 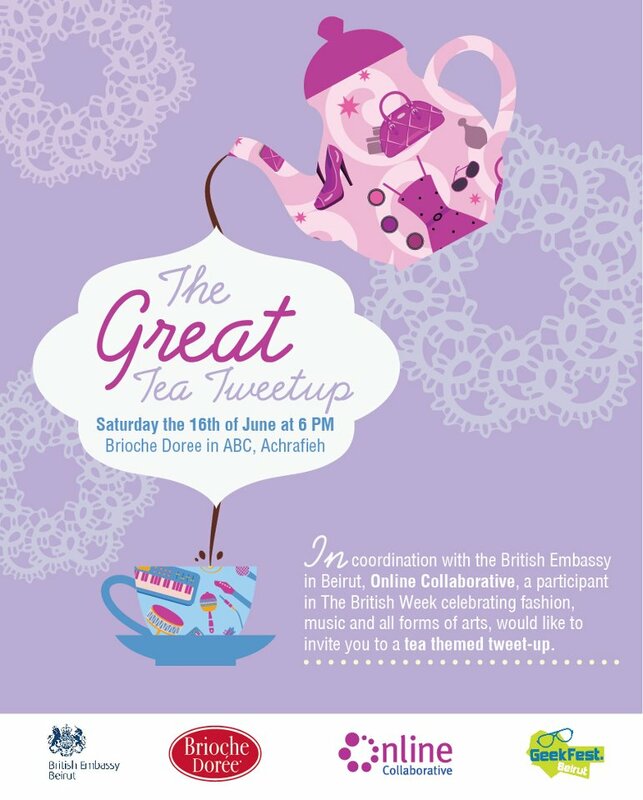 The event was sponsored by Brioche Doree in ABC Achrafieh and attended by a group of influential Lebanese tweeps and bloggers, fashion and graphic designers and of course the British Ambassador to Lebanon, HMA Tom Fletcher and his team. 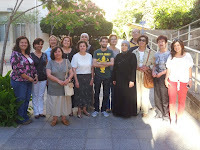 In Spring of 2012, Online Collaborative at AUB hosted a 6-week workshop for senior citizens under the supervision of the University for Seniors and Neighborhood Initiative. During the workshop, the elderly students were familiarized with the concept of social media, as well as tools such as Facebook, Twitter and blogs. Additionally, the workshop included discussions and debates about the proper usage of social media and its ethics as well as hands-on implementation in a computer lab. Online Collaborative hosted three student workshops, two at AUB in Spring of 2011 and 2012, and the third at Haigazian University in Spring 2012. During these courses, students were exposed to the most updated social media topics for personal and business use. These include Facebook, Facebook Pages, Twitter, Google+ and Google Services, Blogging, Pinterest and other social networks, Design and Copyright and Social Media Marketing and Monitoring. 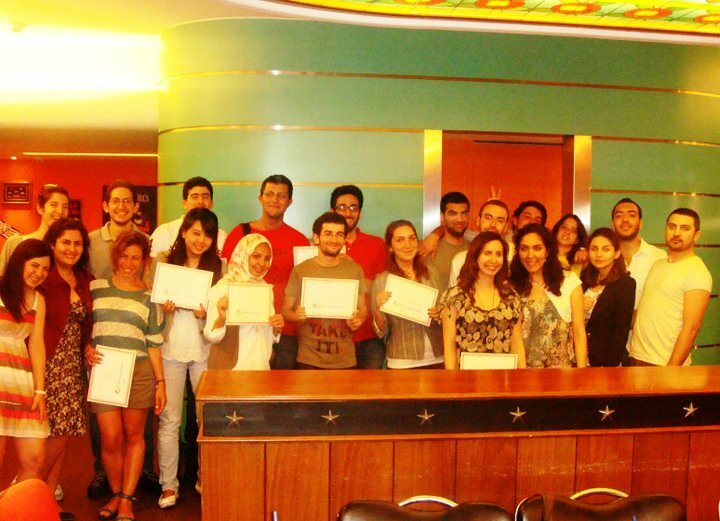 A total of 50 students underwent a final examination and received certificates of attendance for the course. 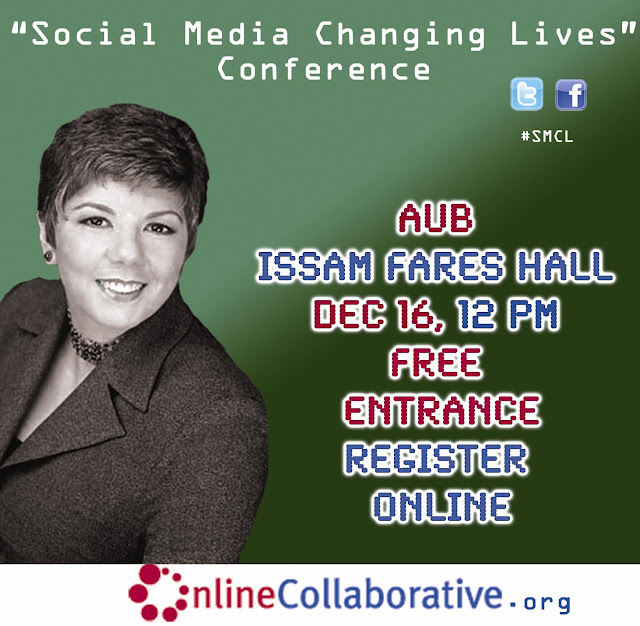 Online Collaborative at AUB hosted its second annual conference entitled "Social Media Changing Lives" on December 16, 2012. This conference, that was open for the general public and attended by more than 400 students, professionals and social media enthusiasts, discussed how social media is affecting many aspects of our lives from education, business and politics to science, music and art. For more information on this conference, check out the press release. 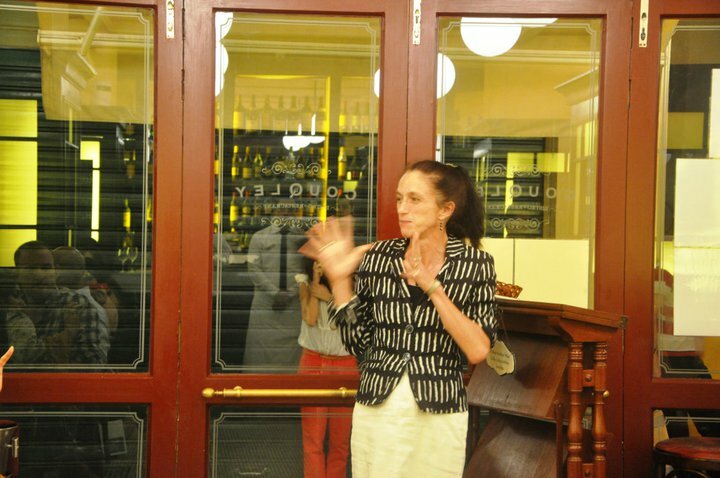 On Tuesday 26th of July 2011, the British Embassy, in collaboration with Online Collaborative, hosted a tweetup dinner to bid farewell to the current British Ambassador to Lebanon, her Excellency Frances Guy. The event was attended by around 50 invited tweeps from different backgrounds and represented different organizations for the Lebanese online community. During the event, the ambassador mingled with the tweeps in an attempt to break down barriers between political figures and the general public. As the first public event, ﻿and on Friday December 3rd 2010, AUB’s Online Collaborative hosted its first event, “Blogging Lebanon” convention at the American University of Beirut. 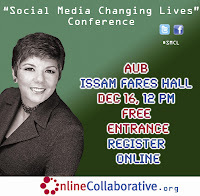 The event attracted around 150 people that included guest speakers, Lebanese and Arab bloggers, students, professors, journalists and people who are interested in social media and blogging in general. For more information on this conference, check out the press release.